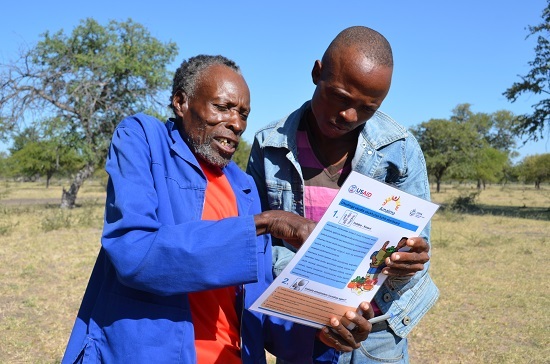 In Western Zimbabwe, just like everywhere else in the world, men and women sometimes need a little help seeing eye to eye. A mid-line survey of the Amalima Project, led by CNFA, showed that the project had made progress in improving some behaviors driving children’s nutrition status. But progress was limited on other behaviors- and the ones that were stuck were those most influenced by the decisions and behaviors of men in the community. TMG was tasked with designing SBC activities to activate men as caregivers. We needed to identify household practices that women wanted help with, and that men were willing and able to do. We conducted separate focus groups- first with women, and then with men- to develop male involvement goals. First, a group of women helped us develop task lists to clarify what child care and agricultural chores men and women were currently doing. We then asked the women to identify which of their current tasks their husbands could do to help them better care for their children. Next, through separate discussions with men, we prioritized tasks from the task list created by the women, to identify those behaviors which men in the community were most willing and able to do. Using this information we designed Male Champion SBC activities that promoted and celebrated these shortlisted practices. After 6 months we conducted a case-control survey and found a statistically significant difference in male supportive behaviors where our campaign was active. 1. Listen to women. We started by focusing on what mattered to women. 2. Engage with men. We talked directly to men to understand what they were willing to do. 3. Build on what you learn. We turned that knowledge into effective SBC activities, helping fathers better contribute to the health of their children.